Anderson's 4 RBIs help Mustangs win tight game to continue hot start. 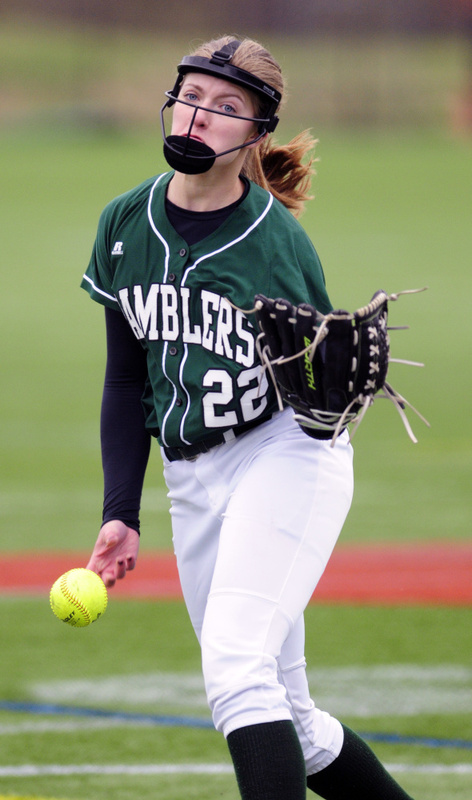 KENTS HILL — En route to an overpowering start to its season, the Monmouth Academy softball team hadn’t encountered many teams able to stand up and give it a challenge. On Tuesday, Winthrop was one of them. The Ramblers wiggled out of jams, charged back from deficits and made the Mustangs work to finish them off. This time, mental toughness was going to be the key for Monmouth. And if there were any questions as to whether they had enough of it, the Mustangs were ready with a response. Monmouth held off a resilient Winthrop team, 6-5, in eight innings in a Mountain Valley Conference game played at Kents Hill School. They had chances. Monmouth struggled to convert on prime scoring chances, leaving 13 runners on base, and even when the Mustangs (6-1) appeared on their way to victory with a 5-2 lead, Winthrop (5-2) rallied right back with a three-run home run from Molly Glaser in the bottom of the sixth. When the game went into extras, Kaplan didn’t see any dip in confidence from his players. Monmouth went to work in the top of the eighth. 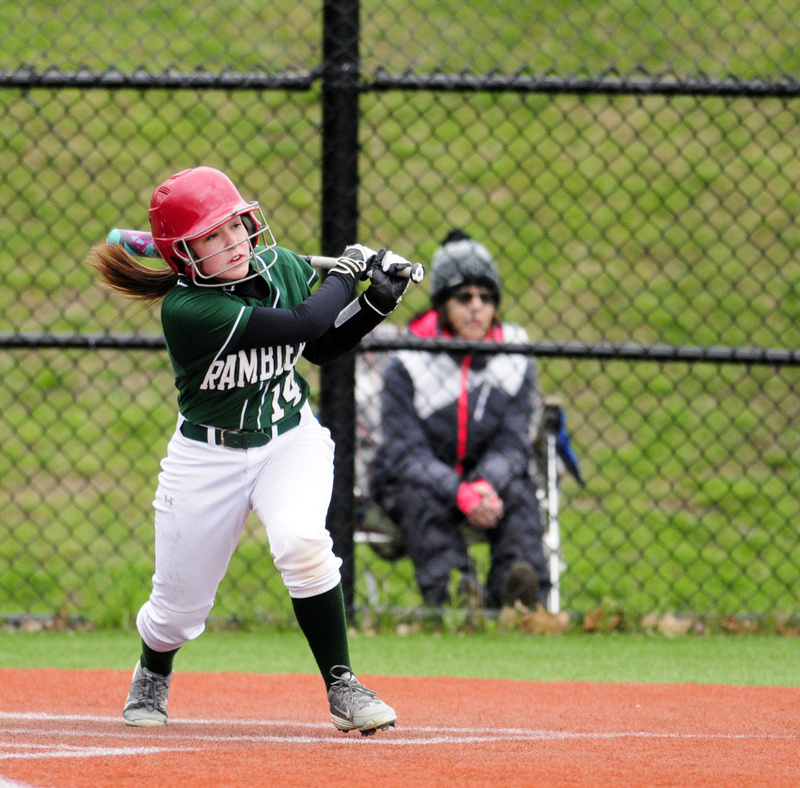 Emily Kaplan dropped a bunt and reached on an error, and Tia Day followed with a single up the middle. Winthrop induced a pop-up from the next batter, but Hannah Anderson — a force all game long with four RBIs — hit a deep fly to right-center field. 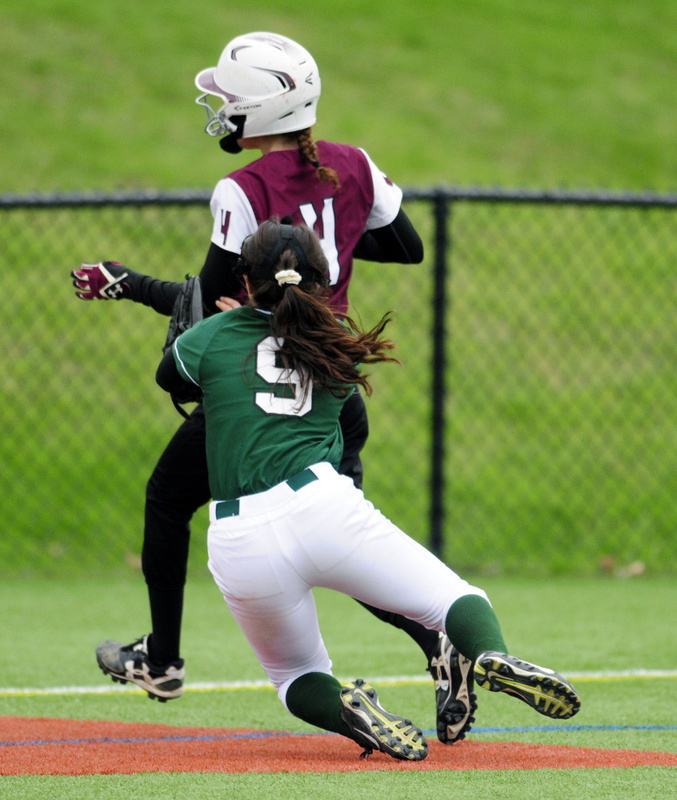 Center fielder Maria Dostie raced into the gap but just missed coming up with the ball, and Kaplan was able to score from second for the go-ahead run. Emily Chasse finished the Ramblers off in the bottom half of the inning to finally seal the win. Monmouth had outscored its last five opponents 87-5 but found runs tougher to come by against Winthrop pitcher Layne Audet. When the Mustangs did break through it was often via Anderson’s bat; the junior third baseman doubled into the right-center field gap to score Kaplan and Haylee Langlois for a 2-0 lead in the first, and then after Winthrop’s Moriah Hajduk tied the game with a two-run triple in the third, Anderson struck again with an inside-the-park home run, again to the opposite field, that brought in Langlois after she smacked a tie-breaking RBI single in the sixth. Winthrop, which had navigated its way out of three bases-loaded jams without allowing a run, had an answer in the bottom half. Kayleigh Oberg led off with a single, Amber Raymond walked two batters later and Glaser followed with a sinking drive down the left-field line. The ball landed fair and kept rolling into the fenceless outfield, allowing Glaser to make it home easily and square the game again. Monmouth had a final rally ready, however, securing a victory that could loom large as the season continues. Winthrop coach Chuck Gurney said that was his takeaway from the game. Even with the loss, containing a powerful Monmouth team was a sign that — after a five-win season last year — the Ramblers are ready to be a team to beat in both the MVC and Class C.